We're still in the sweater weather season, meaning we need to constantly think about the cold and comfort - a topic which I've been talking about in my last few posts. But I think that I saved the best for last, my favourite all-knit outfit. It doesn't get any more comfortable and chic than that. Knitwear from Head to Toe just screams the epitome of street style for me and that's why I love it so much. It's not just about a causal sweater anymore, the focus is now on an all-knit outfit. This has been a big trend of the past few years and it doesn't seem to go away anytime soon. A full knitted look is my favourite trend at the moment and the coziest outfit I wore in a while. However, wearing Knitwear from Head to Toe can be a very tricky trend to pull off. If you've been too afraid to wear everything knitwear until now, then definitely stick around. I prepared some tips to help you achieve the perfect combination of knitwear. Let the knitwear speak for itself. You'll be wearing a head-to-toe texturised outfit, so don't overdo it. As a minimalist I like to play with textures, because that's the easiest way to bring attention to a basic outfit. Besides the knitwear - a black striped turtle neck sweater from Topshop and my white knitted trousers from Zara - I also added a suede texture to the outfit with a black waistcoat from Zara. Now that we've covered the textures, it is time to talk about colours. Keep it simple, keep it monochrome. I wouldn't suggest using any bold colours, because the outfit can consequently feel overdone, bearing in mind the variety of textures and colours. So pairing black and white together is the easiest way to achieve a sophisticated, fashionable look. I also really love the one colour from head to toe look - be it beige, dusty pink, white, grey or black, you can rock whatever you like. Just don't forget to keep it simple. 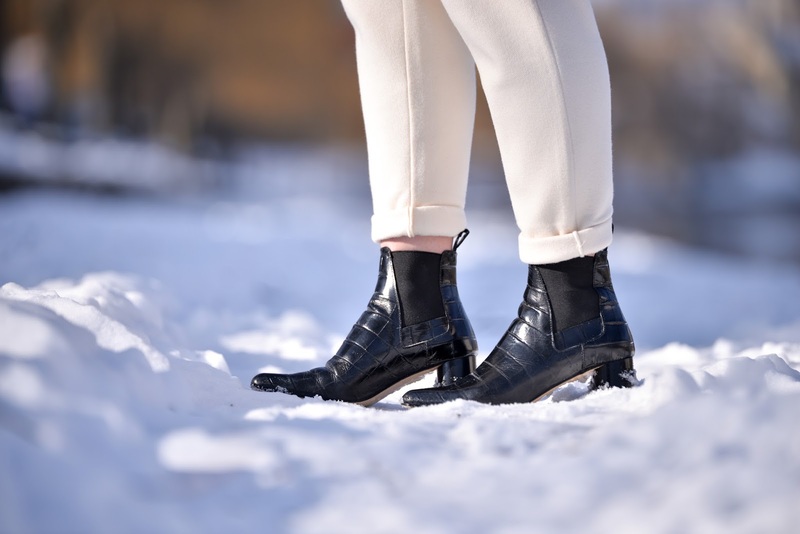 If you're attempting the head to toe knit look, definitely opt for really causal wardrobe staples to pair with the outfit. 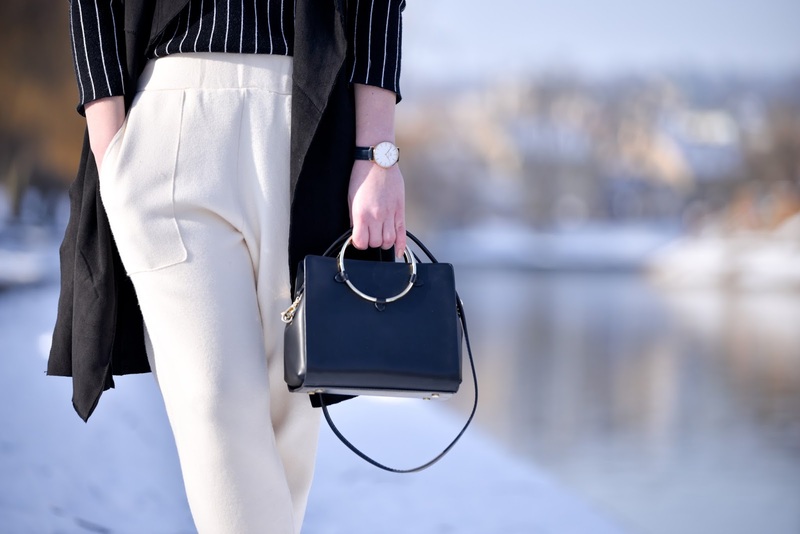 I decided to wear my trusted Zara heeled ankle boots and accessorised with a classic Daniel Wellington watch, structured bag from Zara and oversized sunglasses from Mango.